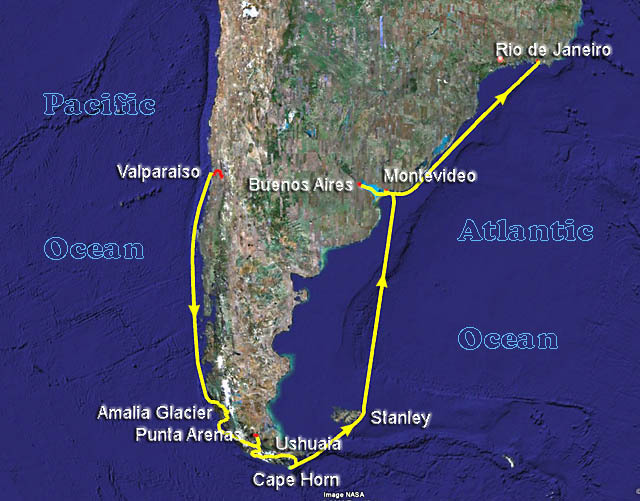 GPS track of the cruise is shown in Yellow. Click on a place name on the map or on thumbnail images to go to the page for that location. Use your browser's back arrow to return here. Note: All photos were taken by Jim Stubchaer using a Casio ExiLim EX-Z750 ultra compact digital camera at 2560x1920 pixels. Many were cropped and/or adjusted using Photo Elements 4. None were edited to add or remove objects. Except for these thumbnails, all were resized to 640 or 480 pixels wide for this presentation.